There are lots of interesting stories this past week leading up to the Super Bowl, naturally, most of them involving football. But sadly, many of them concerned troubled Browns QB Johnny Manziel. It appears that this past week has been the tipping point for many surrounding Manziel, even those who love him and would like to help him. It seems that every day there has been is a new twist to his story. It appears the saga of “Johnny Football” is in rapid decline, coming to a potentially tragic end if he continues to ignore his addiction issues. Since his 10-week stint in rehab for alcohol problems last spring, he’s continued to drink openly as he continues to spiral further out of control. His is a cautionary tale for all of us that talent without the drive and self-discipline to address personal demons is a very slippery slope. Other NFL players like former QB Ryan Leaf and former Browns QB Bernie Kosar, even Charlie Sheen have all reached out to him without any luck. This latest incident began when the 23-year-old’s ex-girlfriend Colleen Crowley accused him of assaulting her and threatening to kill them both. She is the same girl who was involved in a roadside incident with him last October. But after making a domestic violence complaint, she was uncooperative with the Dallas police. As a result, they announced there were no charges filed against Manziel. However, she later decided to talk with police and they’re now investigating him on domestic abuse charges, a criminal offense. As part of this, a judge has signed a restraining order against Manziel that also prohibits him from owning a gun. Manziel’s agent Erik Burhardt has reluctantly released him, saying in a statement that Manziel’s “future rests solely in his own hands.” And earlier in the week the Browns finally made it clear they’re not interested in keeping him, saying that he’s “undermining the hard work of his teammates.” Exactly what they do with him will be dictated by what makes the most financial sense for the team’s cap. But the earliest they can officially part company is March 9, the start of the league’s new year. Manziel’s family has tried twice to get him to enter rehab this past week and he’s refused both times, causing his dad to say, “I truly believe if they can’t get him help, he won’t live to see his 24th birthday.” And finally, the Cowboys, who need a backup QB ready to take over for aging Tony Romo, is reported to be the team of choice for the Texas-native. 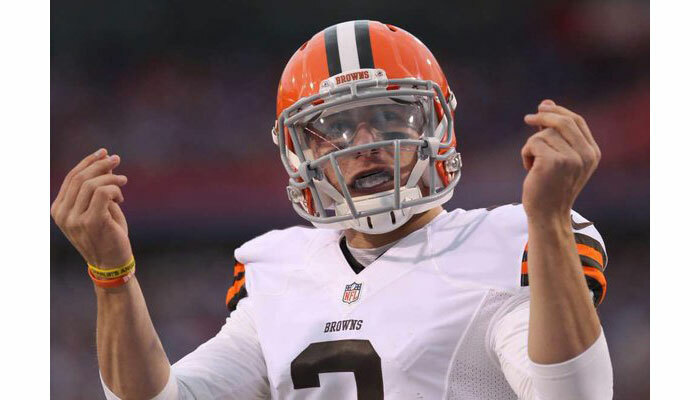 But the Cowboys have made it clear the team won’t be pursuing Manziel in free agency. It’s sad to watch someone crash and burn, especially one with a lot of talent and potential. But over the years he’s stubbornly continued his self-destructive behavior in spite of attempts on the part of his family and various coaches to hold him accountable for it. Hopefully, he’ll hit rock bottom hard enough that he’ll finally get his act together and start to build a productive life, either in or out of football. Powered by Compete partner, RAM Racing.